: Percutaneous endoscopic gastrostomy (PEG) is a common modality used for primary and supplemental feeding for long-term external access. It is generally a safe procedure, however can be associated with many potential complications. Migration of the tube is one of the complications, rarely obstruction of the pancreatic duct is seen. We report a case of a 63 year old female nursing home resident, bed bound from severe Parkinson’s disease who had a (PEG) placed months previously and was send to the Emergency Department with abdominal pain, nausea and vomiting for the last 5 days. Serum Lipase was 5000 U/L. Imaging studies showed the tip of PEG tube with the inflated balloon in the second portion of the duodenum, causing occlusion of pancreatic duct and resultant pancreatitis. At her hospitalization she was placed NPO, the balloon was deflated and changed to a shorter PEG tube. The patient improved shortly after. Our case suggests that it is very important to secure PEG-tube at the level of skin and once the tract is well formed the balloon can be deflated. The migration of percutaneous endoscopic gastrostomy tube (PEG) causing gastrointestinal obstruction is well known. Minor clinical manifestations of gastrotomy tube migration include nausea, vomiting, gastrointestinal bleeding, sudden increased perigastrostomy tube leakage and aspiration pneumonia [1-6]. Gastrostomy tube can migrate to distal organs such as kidney . Among these complications, obstruction of duodenum is very rare, but has higher mortality if the initial diagnosis is missed . Connar and his colleagues  reported two gastrointestinal obstruction cases in 125 gastrostomy patients; one of them was fatal secondary to duodenal obstruction. Haws  also observed one death in five cases of duodenal obstruction after reviewing complications in 240 gastrostomy tube cases. 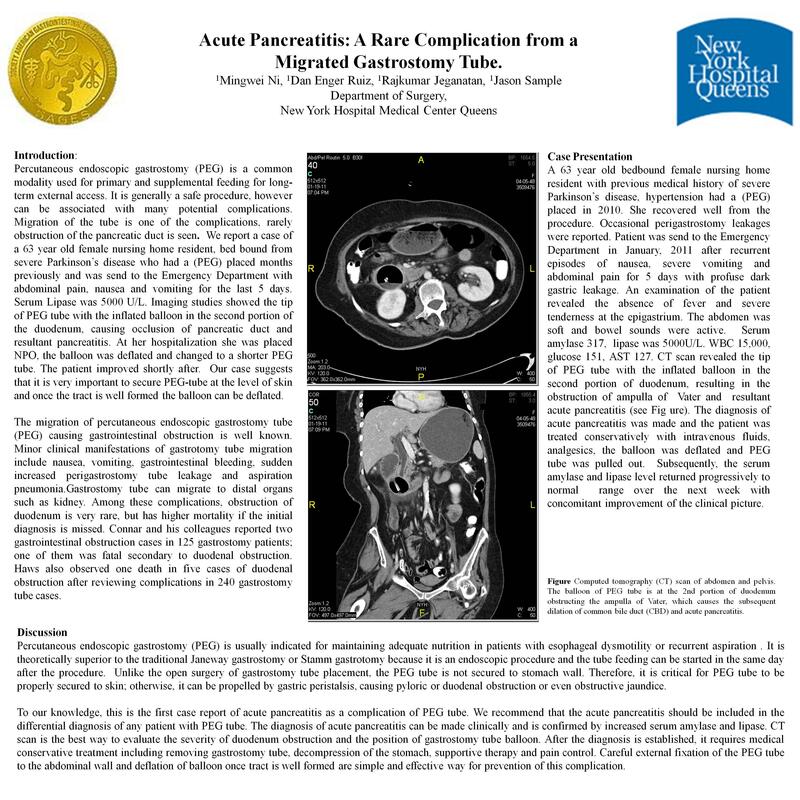 A case of acute pancreatitis caused by migration of inflated balloon of percutaneous endoscopic gastrostomy tube (PEG) into secondary portion of duodenum is presented. To the authors’ knowledge, this complication with percutaneous endoscopic gastrostomy tube (PEG) has not been described before.